The water temperature is 71 degrees and fall turnover conditions allow fish to go deeper, where most likely they will remain for winter. First Stock of Trout will be this Wednesday, November 711, 2018, 600 pounds. 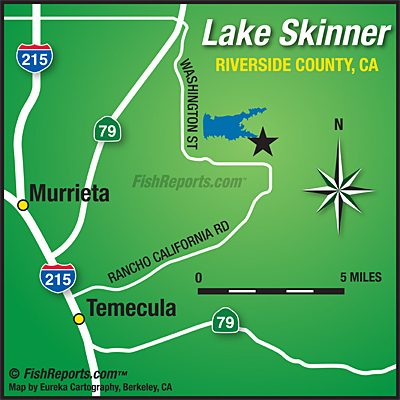 Blue Gill: High Action: Large amount seen and caught this weekend, deep, in the middle of the lake. They are down 20 ft. hitting on Nightcrawlers or Meal Worms. Also try using green and yellow Buggie Jiggies tipped with redworms. Catfish: Medium Action: Cut bait, chicken liver and anchovies still working best... middle of the lake. Striper: Medium Action: Small number of boils early morning and sunset only... Go with either crank baits or swimbaits. Trolling an umbrella rig in the Main Channel and over by Ramp 2.. Large Mouth: Low Action: Early morning bite is best for bigger bass. Try hitting on green pumpkin, purple plastics, and rattletraps. Trout: No Action. Carp: No Action Reported.